Admittedly, we’re not big golfers, but this doesn't matter one bit when you're in Carmel for the AT&T Pebble Beach Pro-Am. A Pro-Am is an event matching professional golfers with amateurs. In this case most of those amateurs are all celebrities. Celebs Bill Murray, Justin Timberlake, Mark Wahlberg and others teamed up with pro golfers like Phil Mickelson and Jordan Spieth for the weekend tournament. Carmel is a beautiful destination all year round, the tournament however breathes a life into the city not found during its usually calmer weekends. 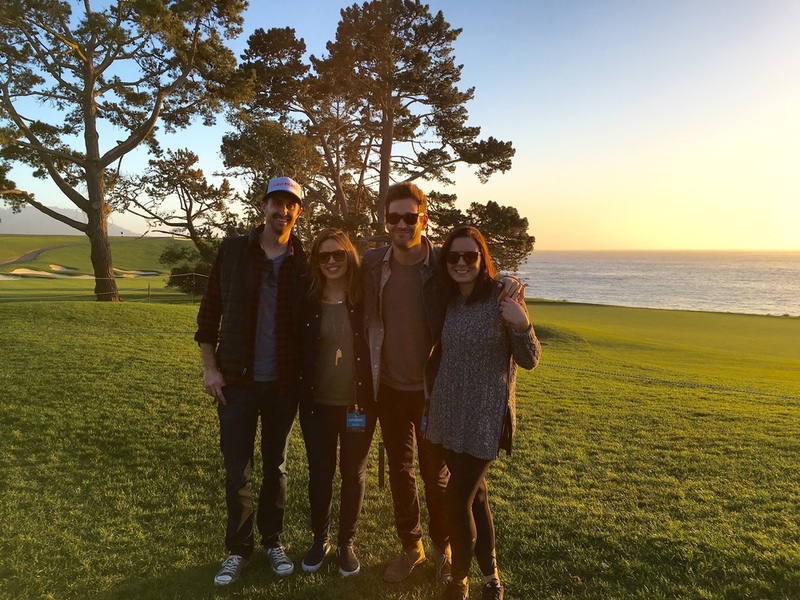 We spent two nights in Carmel with some dear friends enjoying every minute. Friday around sunset was spent at Vesuvio for rooftop cocktails. Their Starlight Rooftop Lounge is much hipper than its name implies. Fire pits and couches create the perfect environment to enjoy a classic Italian cocktail like a Negroni (our favorite) or an Aperol Spritz. We then headed to the casual A.W. Shucks for some oysters and seafood. The night was closed out with one last drink at Hog’s Breath Inn. This is definitely the place to be on this particular weekend. You can really see all the colorful out-of-towner's the tournament brings. One of the best parts of a golf tournament has to be the people watching and we don't mean the celebrities. By midnight the Hog’s Breath Inn was overrun by some serious characters. Saturday we spent the day on the Pebble Beach Golf Links. Carmel is classically Californian, this is a town that once elected Clint Eastwood as mayor, what better way to show off its California chops than with celebrities playing golf on a beach. After a full day of strolling around the course, watching a little bit of golf and a whole lot of beautiful views, it was time to eat. We headed to our reservation at The Bench. This clubhouse restaurant overlooks the 18th hole and has a stunning view down the coast. We ate delicious food, drank great drinks, and even chatted up Bill Murray for a few. It was the perfect way to wrap up a great weekend. 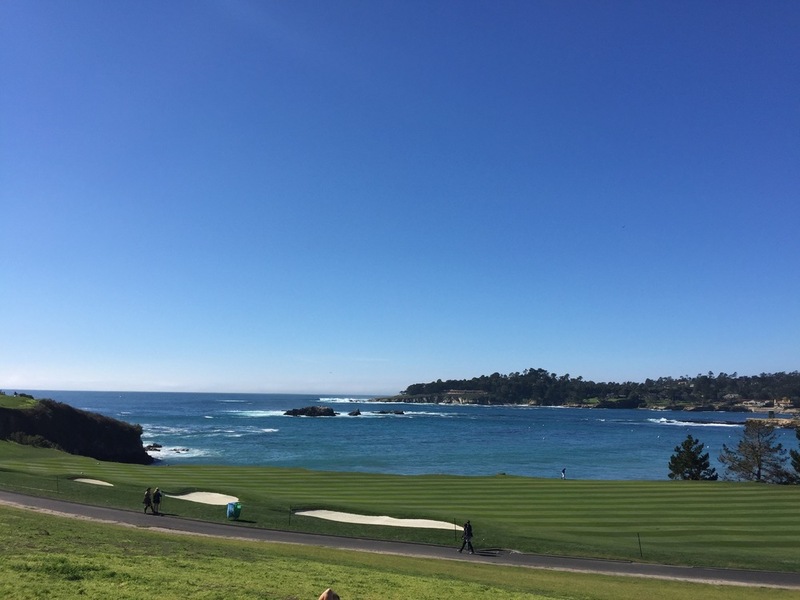 We’re sold on the AT&T Pebble Beach Pro-Am in Carmel. We never thought we’d find ourselves thoroughly enjoying a PGA Tour event, who knew? This is definitely going to be a yearly tradition and we totally recommend making the trip.